A wreath is one of the simplest ways to transform your home. At various points throughout the year, a well-designed seasonal wreath adds pizazz and personality to a front door, mantel or window. We encourage you to change up your wreaths often to keep things looking fresh and timely. With that said, fall is a fun season for crafting. Learn how to make a fabulous fall wreath that will add warmth to your home. These 14 fall wreath tutorials should offer just the inspiration you need. Air plants might just be the new succulents, and a wire wreath gives these faux florals the appearance of being truly airborne. Wrap some fall florals with wire to the wreath base for an easy, inexpensive, and stylish DIY. Hang this on a door, window, or even incorporate a bunch as decor for a bridal shower! The best fall wreaths incorporate coveted seasonal elements like pumpkins, colorful fallen leaves, and burlap. But you're not limited to just fall-inspired elements. Take this wreath, for instance. Instead of orange pumpkins, white pumpkins are used instead. Also, instead of only using warmly-toned maple leaves, some green botanical leaves and moss are added into the mix. Don't be afraid to choose elements that will ultimately coordinate with your home and sense of style. 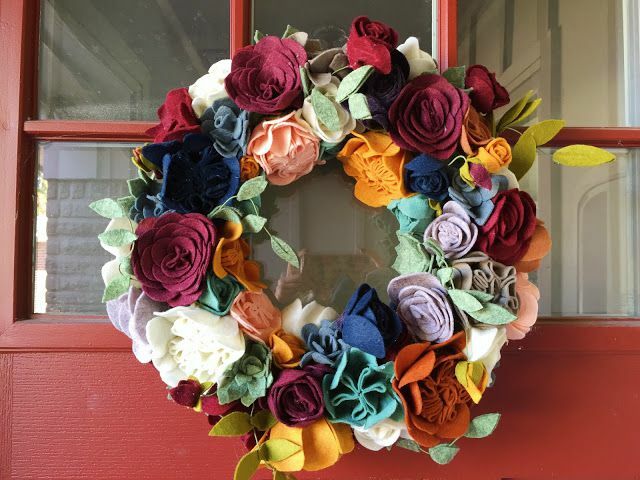 If you love crafting with fall leaves, this is the wreath to try. Not only is this fall leaf wreath large and impressively beautiful, it took the original creator less than ten minutes to make. Who said all craft projects had to be time-consuming? One of the more common types of fall wreaths for farmhouse style homes is the wheat wreath. This wreath might seem simple enough, but it's really important to get the placement right. Make sure the wheat you're working with is bundled with different lengths, so the wreath doesn't look too choppy or uniform. The smaller the wheat bundles, the easier it will be to make this wreath look like something you'd find on Pinterest. Fall berry sprigs are a wonderful way to add depth and dimension to a fall wreath display. However, only using berry sprigs can get a little redundant and boring. This DIY fall wreath also incorporated coordinating fuzzy sprigs to add extra interest to the main section of the wreath base. Warm jeweled tones are popular for fall decor, but a monochrome pop of golden yellow shouldn't be overlooked as an option. This color choice will work great if you have a cool toned blue or purple door, which is opposite of yellow on the color wheel. Wood slice projects are everywhere for fall, but this wood slice wreath is likely one of the easiest to make look good. Rustic style is inherently masculine, which is why we see a lot of raw wood elements. If you think this wreath is too simple or masculine for your taste, add some brown and neutral toned floral elements along the bottom-center or lower-left hand side. Embroidery hoop wreaths are both vintage-inspired and modern looking, but they aren't the easiest to master. Your best bet if you want to tackle this project is to choose some fall-inspired faux florals you love that are on the thinner side. Keep those florals positioned on the hoop in the same way they are here. Also, notice how the ribbon that the wreath hangs from is very thin and plain. This makes sure the hanger doesn't detract from the thin, sleek nature of the wreath. After seeing so many rich crimson-toned fall wreaths, it's a refreshing change of pace to find one that has soft pastels and pinks that you might see in spring. Dried and faux hydrangeas are common in fall wreaths, but they're typically seen in shades of deep brown, orange, and burgundy. We say throw your fall color scheme out the window and have fun with it. If you're afraid the wreath won't have people thinking fall, add a "give thanks" sign like the one here. Burlap bubble wreaths are so inexpensive and versatile, which is why we see so many variations of them. Once you get the basic burlap wreath down, it's easy to use the same wreath for many different seasons. By making the decals detachable, you're able to change out seasonal elements quickly. Instead of gluing on the fall leaves you see here, opt to adhere them with velcro instead. Then, think about other elements you can add for winter and spring. This fall wreath DIY is a fan favorite and for good reason. Not only does it look good, but it is relatively simple to recreate. Your main challenge will be finding a color scheme that looks good with your home and other fall decor. If in doubt, you can never go wrong with jeweled tones in four or five different shades. Center the majority of your leaves at the center and then let a few wander off course in the same direction as the wreath base. If you're the type of crafter that loves repurposing everyday items into your projects, then this is the tutorial for you. Natural coffee filters go from ordinary to feminine and fall-worthy in a manner of minutes. If you only have access to white coffee filters, simply stain them with some coffee to get this look.